Quick: How long as Brancott Estate been growing grapes and producing wine? 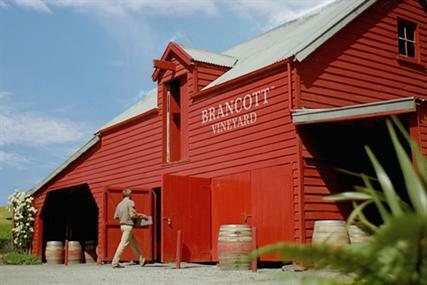 You might be surprised to learn that the company now known as Brancott has been around since 1934, when the company (then known as Montana Wines) first start planting grape vines in New Zealand. Fast forward to 1975, when the first sauvignon blanc grapes were planted in Marlborough at the Brancott Vineyard. As we know today, that was the beginning of something big. Now Brancott Estate is the largest producer and exporter of Marlborough sauvignon blanc in New Zealand. Their signature style of high acid, citrus-flavor themed white wines has been around since 1979 when the first vintage was released.Within a few years, Brancott sauvignon blanc was winning accolades all over the world. Here in the United States, a veritable wave of inexpensive sauvignon blanc washed over our shores, to be lapped up by a wine drinking public looking for light, friendly white wines at low prices. I was recently sent the new releases from Brancott Estate, and sat down one day to taste through them in order to see if much has changed since my first Brancott wine, almost a decade ago. The wines remain true to form, as inexpensive, high quality, easy drinking whites and reds. I was once again pleased to find these New Zealand wines varietally honest and straightforward. It's no wonder that they are on so many restaurant wine lists, and on so many wine drinker's shopping lists. 2010 Brancott Pinot Grigio Marlborough: Pours as clear as Sprite into the glass. The bouquet is lightly grassy, complemented with lemon notes. Secondary aromas include summer flowers and a touch of pineapple. For such an inexpensive, high-production wine, the bouquet is impressively complex. In typical pinot grigio fashion, the citrus-themed acid notes approach fast and hard, coating the palate before giving way to a gentle mid-palate of tropical fruit and hints of pear. While simple and a bit disconnected from the complexity of the bouquet, the mouthfeel is good and refreshing. This New Zealand pinot grigio is more interesting than a lot of Italian bottles. For a good time, blind pour it for some wine-geek friends and ask them to guess. 13.2% abv. $10 suggested retail. 2011 Brancott Sauvignon Blanc Marlborough: A pale yellow color, if I was fancy I'd say "delicate straw" or some other banal term. The aromas are very nice, a mix of lime juice, grass, and kiwi fruit. Hints of pineapple peek out from around the lime-citrus edges. When tasted at proper temperature (hint: not straight from the fridge) I also detected a wonderfully ripe passion fruit aroma that helped temper the lime and grass. On the palate the acid screams out at me, leading to a procession of citrus, gooseberry, and pleasant minerality. The finish is quick, a touch more citrus and it's all over. I'd love this wine paired with grilled fish, scallops, or a salad with creamy ranch dressing. Even by itself, this is a nice, fun sauvignon blanc. In my opinion, there's no need to over-pay for a sauvignon blanc from Napa Valley when for under $10 you can drink this. 12.5% abv. 2010 Brancott Pinot Noir Marlborough: Dark red, bordering on garnet, all the way through. The nose is interesting, some forest-floor notes, a hint of funk (the good kind), and an undertone of dark berry fruit. On the palate the Brancott has a darker orientation as well, more black cherry, plum, and a hint of leather. I also feel the acidity is a bit harsher, not as nicely integrated as other New Zealand examples. Still, you could do a lot worse for around $10. Perhaps the biggest fault in the wine is the finish, it evaporates into nothingness far too soon, leaving a bitter, stemmy quality behind. Bottle age will help out with the flavor integration issues but again, at the $10 price point you can do far worse. I'd happily drink a glass of this with salmon or red meat. The Brancott wines are often maligned by wine geeks (bloggers included) as being to homogenous, a familiar refrain being that they're not worth drinking because they are mass produced. What those out of touch people fail to realize is that Brancott is everywhere and at under $10, provides an excellent level of quality. Sure, production is high, but it's consistently a high-sales brand and therefore we can infer that Brancott's style appeals to many people. For that reason, I recommend any of these wines to those of you looking for a consistent, reliable producer with a fun back-story and great availability. None of these wines will knock your socks off but as I said in the pinot noir review, you can sure do a lot worse for around $10.